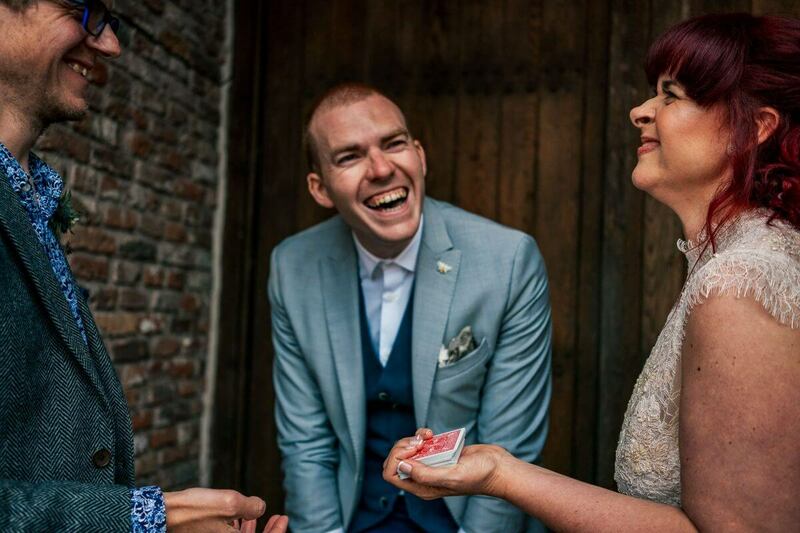 Your Wedding Entertainment - Sam Fitton, Manchester Wedding Magician. Well, congratulations are in order! Not only are you getting married but you’ve found yourself on *probably* one of the most useful (and honest) wedding planning pages on the internet. Hurray! 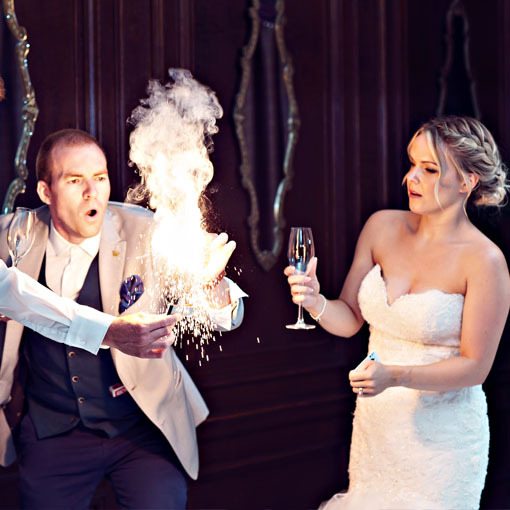 You hire exceptional wedding entertainment *cough* Me *cough* to mingle with your guests, blow their socks off with amazing TV-like magic and to get the party started! There’ll not be a bored wedding guest in sight and you can relax knowing everyone is having a great time. Mission accomplished. After a big meal, and of course your speeches, your guests have a problem. I like to call it a case of the ‘wedding zombies’ or more traditionally, the dreaded ‘food coma.’ Your guests start to slow down and with evening guests arriving soon that’s the last thing we want! Cue, Sam Fitton, wedding entertainment and wedding zombie slayer (sort of). 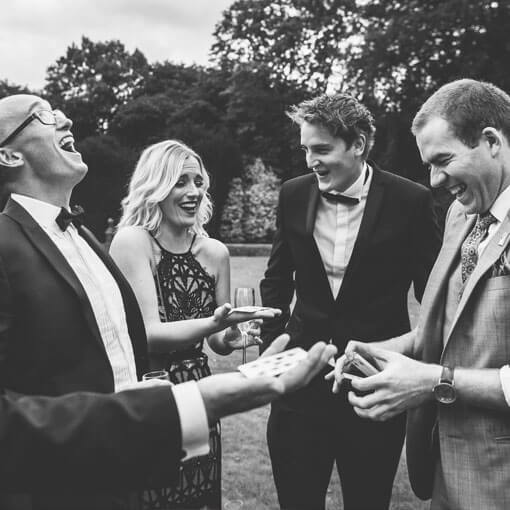 My larger-than-life personality, enthusiasm, awesome magic and interactive wedding entertainment will have guests off their seats cheering, clapping and wanting to see more. What’s more, evening guests arrive and see your day guests having a whale of a time and it sets the perfect tone for an amazing party. Yep, that’s right. You can have me all day! This is especially useful if you have a lot of guests and want a truly seamless and stress free wedding experience. As part of my exclusive all day wedding entertainment I perform during both your drinks reception & turnover and I’m on hand throughout your day as your ‘go to’ guy. Your drinks reception will be rockin’ and your turnover will see me get the party started in my renowned enthusiastic and energetic style. 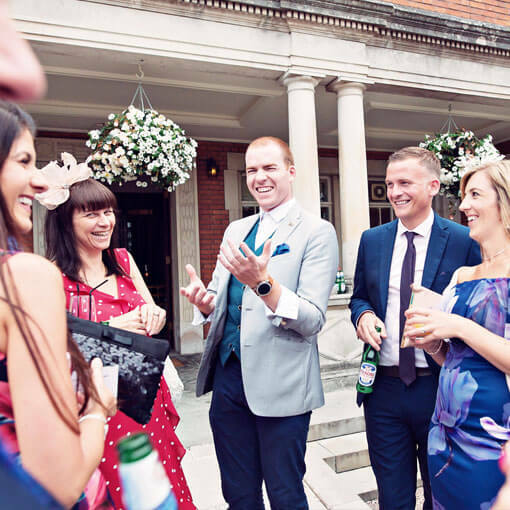 On top of that I also offer Master of Ceremonies (Toastmaster) duties or recently known as ‘Day Hosting’ to create a wonderful, upbeat, modern and relaxed wedding entertainment experience. Your whole day will flow neatly and the continuity between each part of your day makes for a truly stress-free, fun and modern twist. 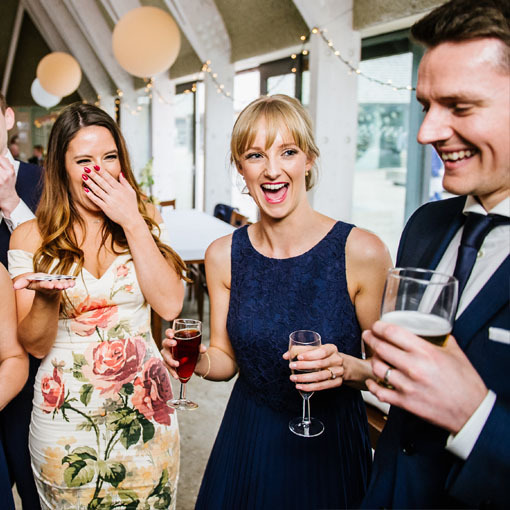 All day wedding entertainment suits larger weddings or weddings where a lot of evening guests are expected to join the party! Elizabeth & Antony said this recently, “We cannot thank you enough for your great work that impressed EVERYONE and your wonderful MC skills. Thank you so much for surpassing our expectations and for just being a great guy.” Nailed it. Creating unforgettable weddings with amazing wedding entertainment is just what I do, but there’s one more thing just for you. Wedding Truth Bomb: Your wedding is full on. It’s crazy busy, you’re in demand, the most popular people in the room and rightly so! However, this does mean you can’t be everywhere at every moment so I arrange something special for the happy couple where you get a few minutes down time. This unique performance has become an infamous showstopper in the wedding industry and leaves you with an awesome gift from me, a special, one-of-a-kind souvenir and a carefully choreographed photo / video moment that I will orchestrate with your wedding team on the big day. And that’s all I’m saying! Oh except to mention… It’s nothing silly, embarrassing or humiliating. I’m not that guy. Let’s keep it simple… Complete the form below and hit ‘submit’ & I’ll be in touch soon.